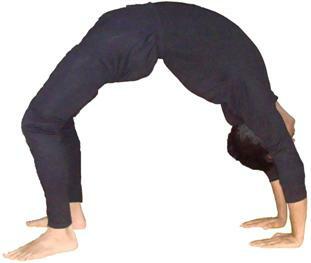 Chakrasana is the most important and fundamental backbend. In this pose, you have to lie on your back and push up, balancing just on the hands and feet. This pose is called a bridge. A back limber is a skill in which the pose is achieved by bending backward from a standing position. Lie facing upward on the floor. Bend your elbows and spread your palms on the floor beside your head. Forearms relatively perpendicular to the floor, fingertips pointing towards shoulders. While inhaling, slowly begin to raise the head, back and buttocks off the floor while arcing the spine. Hold for the duration of the held inhaled breath. When you can’t hold the breath comfortable any longer, slowly exhale and return the back to the floor. Slide the legs out straight returning to the shavasan. Strengthens the arms, wrists, buttocks, abdomen and spine. Stimulates the thyroid and pituitary. Therapeutic for asthma, back pain, infertility and osteoporosis. Not for the persons, who have back injury, carpel tunnel and syndrome, diarrhoea, headache, heart problems, high or low blood pressure.